In the USA, prom is the celebration of both an ending and a beginning. It is a time for students on the brink of new adventures and paths to dress fabulously and enjoy themselves with their oldest friends for a magical evening. Young people don’t often get the opportunity to dress for a formal, black tie occasion; so understandably, finding the perfect outfit is an important rite of passage. Over the years, proms have been an integral part of popular culture and with the birth of Instagram, young women’s dresses have been shared far and wide to the collective delight of all fashion lovers. Here, we have listed some of our favourite prom outfits, from real proms to ones represented in fiction, all of which are beautiful and inspiring. In 2011, when she was just 17 years old, supermodel Lindsey Wixson wore a gorgeous cobalt blue off-the-shoulder dress to her prom, designed for her specifically by Jason Wu. Even at such a young age, Wixson had lots of designer friends, having walked and modelled for a number of big fashion houses like Alexander McQueen, Mulberry, Miu Miu and John Galliano. Her popularity with these big designers lies in her truly unique and inimitable look, proving that embracing your individuality can take you extremely far in life and help you to stand out from the crowd. She helped Wu, who has previously made dresses for Michelle Obama, design the custom-made couture dress which is fun and flirty, falling elegantly off her shoulders and finishing just above her knee. Lindsey has continued to be one of the world’s most popular models, in the last season walking for designers like Chanel and Oscar de la Renta. Once her modelling career has finished, she has said that she would like to become a pilot. Completely unknown nationally and internationally before her prom night, Kyemah set fire to the internet with her stunning African-inspired dress, which she posted on Instagram. Amazingly, she designed the dress herself using striking reds, greens, yellows and blues to create traditional African prints all the way throughout. It is a dramatic, statement dress, incorporating long sleeves, a maxi-hemline with a full skirt and a plunging V-neck, that nods emphatically to her cultural origins, all of which she clearly embraces and draws from. She completed her look with her hair left in a natural afro-style and simple yet modern gold jewellery, so that all attention was drawn to her dress. Kyemah went on to become prom queen and is set to attend Parson’s School of Design in New York (and we can see why!) 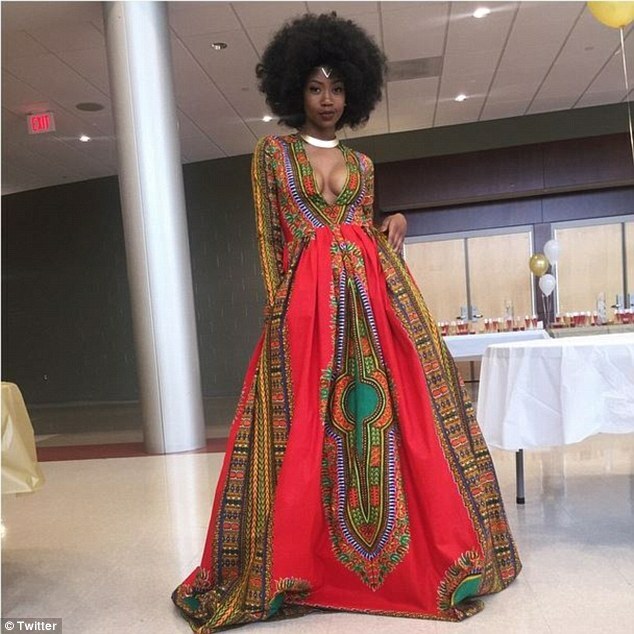 Kyemah is a true innovator and inspiration, her dress showing us that beauty and strength can come from a clear sense and love of our own personal heritages. We’ll definitely be seeing more of her in the future. No best dressed list can ever be completed without Blair Waldorf, the main character of hit show Gossip Girl. Blair is renowned for her preppy style, incorporating prim dresses and two-pieces with her signature headbands and popping coloured tights. Although socially she is selective and entitled, there is something incredibly sassy about Blair, her desire for control and self-empowerment and the high standards that she sets for herself. Her prom dress was in-keeping with the rest of her wardrobe, a luxurious and extravagant number designed by British design house Marchesa. Whilst many go for colourful prom dresses, Blair’s was striking in black and covered with delicate gold leafing that resembles fanned peacock feathers. The feathers form the dress’ corset before cascading over the rest of her skirt. It is undeniably dramatic and given a regal finish with a splash of red lipstick and heirloom jewellery. Emulate her style by looking to unusual yet dynamic colour combinations when picking your own dress. Shop this wholesale clothing supplier for more styles and inspiration. I love getting all fancy in oretty dresses! I think adults should get a prom to attend! What a nice collection of dresses! I love Blair's dress. so perfect!